Viral outbreak/contagion/zombie/the world is going to hell movies are nothing new. Whether it’s Night of the Living Dead, The Crazies, 10 Cloverfield Lane, The Mist or any derivation thereof, films depicting a group of disparate people barricaded indoors whilst something evil from outside comes their way – all the while fighting, colluding, backstabbing and sometimes even cooperating in hopes of survival are nothing new. What is novel though is when the besieged is comprised of a group of 30-something Hollywood wannabes, has-beens, never-will bes, plus a select few who had the better sense to leave their dreams of stardom behind and get out while the getting was still good. Throw in the fact that one is pregnant, and there’s a rabid, homicidal clown brandishing an acoustic guitar who’s causing all sorts of havoc outside, and things start to get just a little more original. Killer Party, the debut feature from writer/director Alex Drummond, depicts such a scenario. Nick is an unemployed writer/screenwriter heavily in debt. His wife Mary is an actress/waitress slightly more successful than he is. She’s also very pregnant, so her friend, former child star turned Hollywood cliché agent Joanne, has decided to throw her a shower. Friends and acquaintances show up, including right-wing political aspirant Edmund and his wife Caroline, hottie Kim and her new boyfriend, moderately successful actor Ryan, and Kim’s still-hasn’t-gotten-over-her ex, unsuccessful actor Tommy. The guests arrive, the tykes are shunted away to be entertained/babysat by the clown, and the adults get down to drinking and mingling. While some of the assembled genuinely seem to like each other, others find it hard to mask their feelings, ranging from mild annoyance to outright contempt. But, as is the case at all parties, small talk must be made, and really, is there anything more potentially enraging than small talk at parties? The more successful of the bunch subtly lord over the less accomplished while others stew in their aggravation. This part of the film is wonderfully relatable and entertaining, and a good film could have been made depicting just the interactions between these partygoers. But this is a horror film, so something must go awry. And that something comes in the form of neighbor Fred. He stumbles into the house covered in blood and clutching a knife, babbling something about his wife going crazy which is why he had to put her down. Before long, the clown has bitten a sizable chunk out of party-host Joanne, deranged neighbors are hovering ominously outside, roads out of the subdivision are barricaded, and all hell is breaking loose. And if things were bad among the party guests before, having to band together to survive whatever apocalyptic event is raging outside is just gonna make things worse. The outbreak aspect of the film does bear the taint of familiarity, but there’s enough humor to keep things entertaining: the disposal of Joanne’s not-quite dead body and Tommy voluntarily quarantining himself with the likely-infected Kim just so he could possibly get back into her pants being two particularly inspired bits. 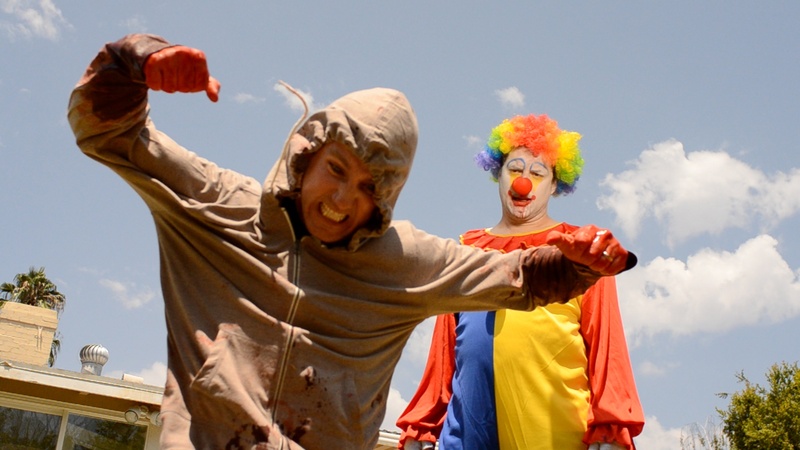 Killer Party is a horror-comedy more akin to Shaun of the Dead than Dawn of the Dead, so it’s not particularly scary, but it is funny, and to Drummond’s credit, he doesn’t skimp on the gore, which is efficient, bloody and plentiful. The performances are uniformly strong, with Drummond’s real-life wife, Rachel as the charming Mary proving a particular standout. Ultimately, Killer Party is an entertaining if imperfect film. Certain scenarioss are riotous while others, particularly those near the end, have a slight tendency to drag. Nonetheless, the film looks great, the cast is likeable, and there’s a delicious slice of Hollywood satire served up alongside the yummy gore. This entry was posted in Black comedy and tagged 2010s movies, Comedy horror by Really Awful Movies. Bookmark the permalink.